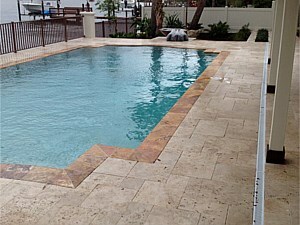 Border Creations, Inc. is the leading custom pool builder in the state of Florida. For more than two decades, we have designed and built countless pools for home owners in Brandon, Tampa, Lutz, and other major cities in the state. And our long list of completed projects is not only limited to residential properties -- we have also served a lot of commercial property owners who need expertly built water features in their properties. From small family pools to large infinity pools for commercial areas, we can design and build them. Let us improve the functionality and aesthetics of your outdoors by allowing us to build professionally designed custom pools. We have the required skills, logistics capabilities, and reliable partners to ensure successful installation. Call us today at 813-926-2700 or visit our office so we can discuss further your plans, ideas, and project requirements. 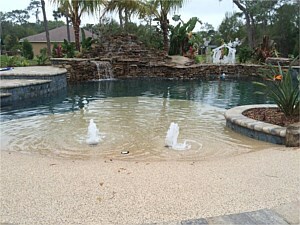 One of our strengths as a custom pool builder is our ability to create unique and stunning pool designs. We are able to provide this kind of service because of our 3D design software, a computer-aided design tool used by the leaders in the industry. It allows our pool designers to use their creativity in developing outstanding design plans. With this software, our designers can easily infuse new design elements or add features to make pools more functional and more attractive. 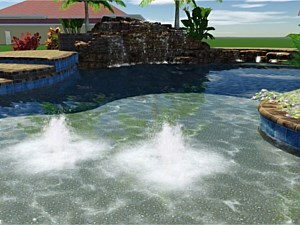 Our 3D pool design service is also one of the reasons why a lot of homeowners in Lutz, FL and other areas we serve choose us to be their custom pool builder. Aside from the stunning designs that we can create, they can get realistic visuals of the swimming pools that we will build for them. We can also make outright revisions or enhancements just in case they are not satisfied with the pool's features and amenities. We allow revisions until they are fully satisfied with the proposed design. We don't just create pools or build them using subpar materials. Our creations are noted for their sturdy construction, fine workmanship, and awesome designs. Our main objective is to give clients stunning pools that they can enjoy for years to come. And we are successful in achieving this objective by employing the right people, using appropriate tools and equipment, and, most importantly, using top-quality construction materials. As an experienced custom pool builder, we are able to establish strong partnerships with the leading suppliers in the country. With the best suppliers on our side, we can provide our clients with the finest products and supplies. Some of our suppliers include Belgard, Tremron, Artistic Pavers, and Old Castle. These companies offer a myriad of products that help us complete pool installation projects with ease. We offer outstanding design services and quality installation that can't be matched by other custom pool builders in Florida. Lutz homeowners and clients from nearby areas can now have their dream pools with the help of Border Creations, Inc. Our impressive portfolio of completed pool installation projects is a proof that we are a reliable custom pool builder. So don't hesitate to contact us for your pool remodeling or installation needs. With us, you'll surely get the perfect pool that you have envisioned.